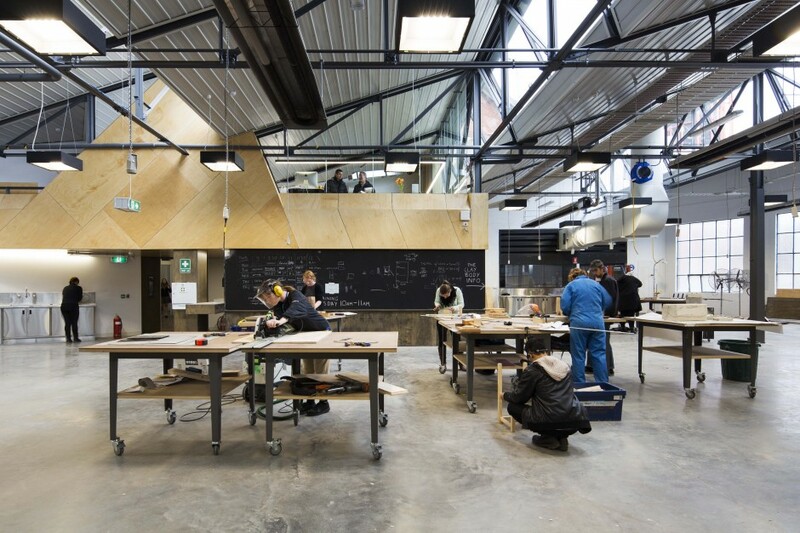 In a short six months, the Victorian College of the Arts’ (VCA) Teaching Workshop on the University of Melbourne’s Southbank campus has transcended from an industrial blue-collar workshop to become a cutting edge research facility where manufacturing outcomes are unlimited. 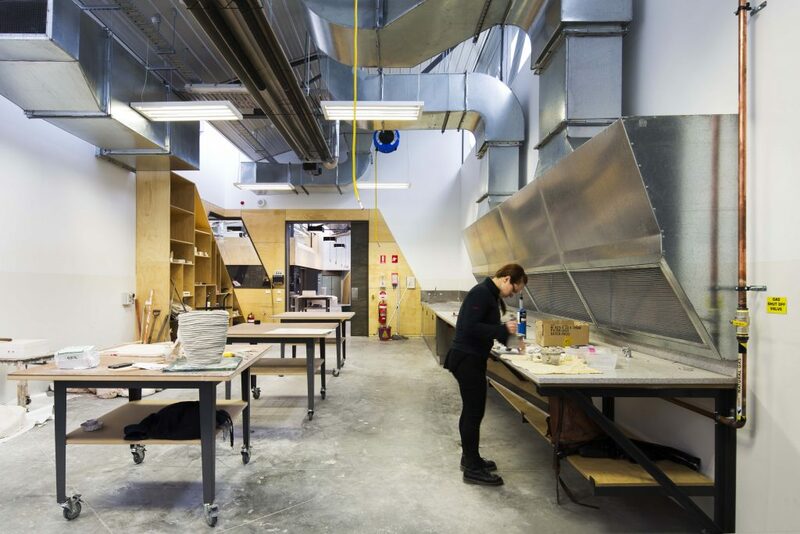 Around 700 students from visual art, production, and film and television, who have not collaborated in the past, will now come together over the course of a year to share ideas and build in specific process spaces, including a central construction area, a welding and foundry room, a wet mould room, a wood machining shop including a special sanding room. The students may be building for different artistic mediums, but pragmatically they often undertake very similar processes. The Teaching Workshop. Photographer: Ben Hosking. Workshops Manager Dr Tim Edwards, who’s been working on the project for four years, says after reading, thinking and talking to people about workshop design in the University environment, he believes there’s nothing else that exists like it. The workshop staff were able to tell architect Steve Hatzellis exactly what they required in the space since they’ve been working there for years. From experience, they know exactly what does and doesn’t work. Edwards, who began at the VCA as a casual lecturer in Sculpture and Spatial Practice in 2008, previously worked at the University of Tasmania where he was involved in designing the School of Visual and Performing Arts Sculpture Workshop. This meant he had a clear idea of the requirements and process of building a good workshop. It was like a game of chess with room space size and placement. The external skeleton of the old workshop has remained intact, but the roof trusses dictated where walls had to go. “Previously there was lots of wasted space and the rooms were too small to function very well, so combining them we were able to get more space and usability and make it much safer,” says Edwards. Occupational health and safety (OHS) standards have a scale of low, medium and high risk activity. 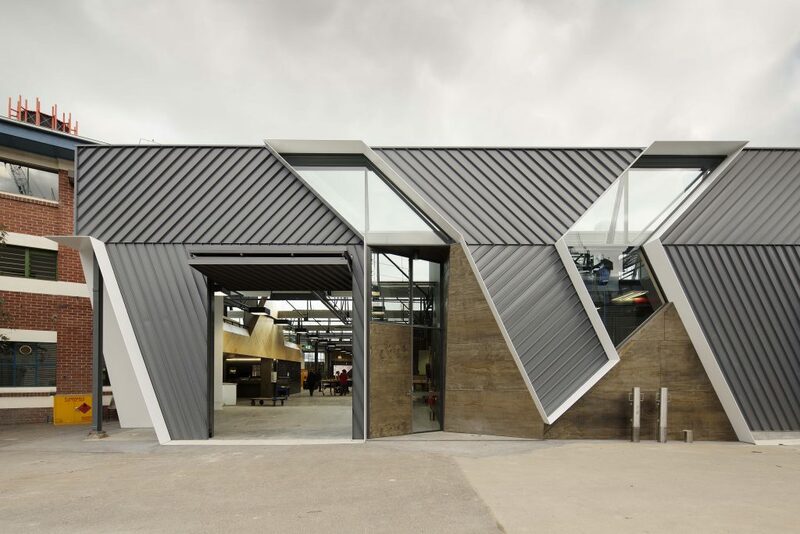 Just about everything that takes place in the workshop is high risk, so the underpinning design brief was to combine the different workshop spaces with best OHS practice. 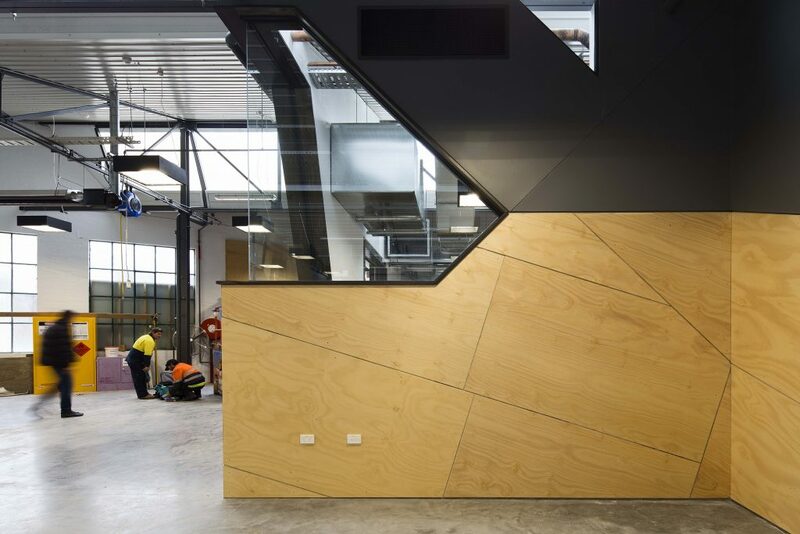 In principle, you bring your materials through the 3 metre high soundproof doors, get them on to the table, mark out, measure, fit your safety protection gear from the OHS station, take the materials into the machine shops on the custom-built four-wheel tables, then wheel them back out into the construction area to assemble. It’s all about workshop flow. The wet area is for ceramics and mould making out of clay and is also part of the foundry where the initial object is made from wax. There is a specific wax working area with a granite benchtop and Bunsen burners. The wet mould room. Photographer: Ben Hosking. In the hot metals room there is a new foundry furnace, a foundry kiln and a new ceramic kiln. There’s a long, thick solid steel bench which is completely dead flat. “When you’re a metal sculptor, that welding bench is like a Louis Vuitton handbag!” says Edwards. Welding creates highly toxic fumes, so rather than use ducts which pull the air across your body (as in 90% of other spaces), a bank has been made above the bench so all the smoke, dust and fumes are pulled away from you in the opposite direction. In the wood machining shop there’s a computer-controlled router and various methods of carving and sanding. New ducting means the wood dust won’t be swirling around the space any more. The wood machining shop. Photographer: Ben Hosking. For a space with concrete floors and masses of wood, the acoustics have been dampened thanks to the wool insulation in the roof which was previously exposed tin. There is very little sound bleed between each workshop. Because you can’t hear the students, the large windows were a key component of the design brief. “We need to be able to see them at a glance, to make sure they’re okay,” say Edwards. The upstairs office, which creates a better use of space, also provides an opportunity to see what’s going on below. 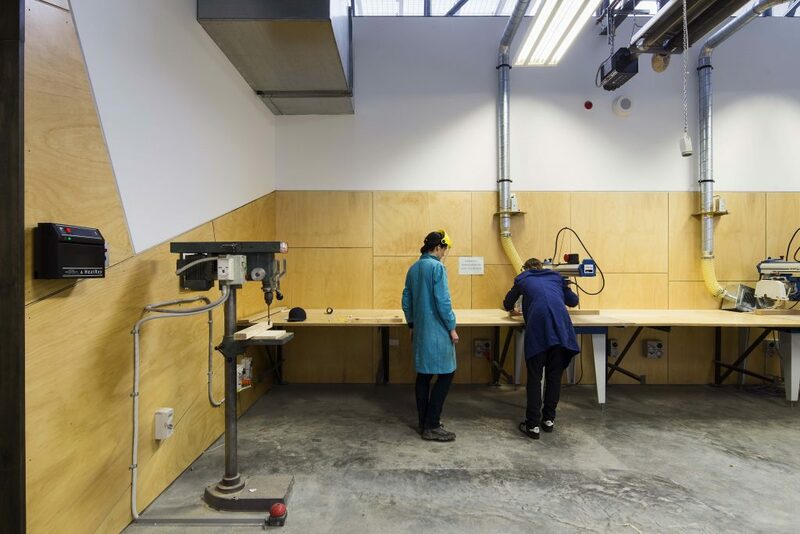 The Teaching Workshop fits within the broader development of the VCA & MCM’s Southbank campus, a venture funded jointly by The Myer Foundation, The Ian Potter Foundation, the University of Melbourne and the State Government through Creative Victoria. Banner Image: The central construction area with an overhead office. Photographer: Ben Hosking.